Ghostbusters West Virginia Division is represented by a panel discussion with Adam Ash, Jimmy Pettry and Jack Arkham. The ghostbusting trio discuss why they do what they do, their equipment and more. Later, we see a snippet of the Junior Ghostbuster Training Session, hosted by Kevin Pauley and recorded by Lee Harrah. All of this happened at ShockaCon 2015. For more information on Ghostbusters West Virginia Division, visit their Facebook page. PopCult has been presenting video of ShockaCon 2015 for several days now. You can see the Costume Parade HERE and Hurl Brickbats on the RFC MINI SHOW HERE. Earlier we presented panels from American Horor Story, The Walking Dead and Ari Lehman, the First Jason. Daniel Boyd presented a Horror Writing workshop, while a “Women In Horror” panel discussion stole the show. Professor Sinister’s Savage Sideshow has also been posted here. There were also three guys talking about science fiction toys. Our previous panels were all about the modern Doctor Who and Horror Punk. George Durbin III moderates a panel on Horror Punk music with Argyle Goolsby, The Renfields and The Cryptoids. The bands discuss their origins, their influences and talk about some of their most memorable shows. All the bands on this panel performed at ShockaCon’s after-hours party, and showed off their horrific punk prowess. This panel has one edit where your PopCulteer had to switch cameras due to a battery giving out. So sadly we missed the part where Glenn Danzig stuck his head in the door and told everybody that they were better than he was. But the rest of the panel is a lot of fun, so you didn’t miss much. PopCult has been presnting video of ShockaCon 2015 for several days now. You can see the Costume Parade HERE and Hurl Brickbats on the RFC MINI SHOW HERE. Earlier we presented panels from American Horor Story, The Walking Dead and Ari Lehman, the First Jason. Daniel Boyd presented a Horror Writing workshop, while a “Women In Horror” panel discussion stole the show. Professor Sinister’s Savage Sideshow has also been posted here. There were also three guys talking about science fiction toys. Our previous panel was all about the modern Doctor Who. Ronn Smith, the producer and star of Doctor Who: The Classic Series Regenerated, takes a look at the highlights and lowlights of the revived version of Doctor Who, which is starting its tenth season. 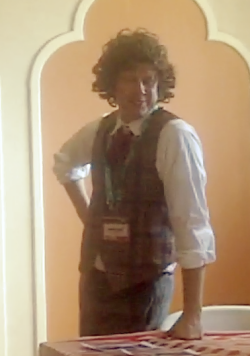 Smith also presents a new trailer for his own, fan-made project, which revisits the classic Tom Baker era of the Doctor. PopCult will present more video of ShockaCon 2015 all weekend long and into next week. You can see the Costume Parade HERE and Hurl Brickbats on the RFC MINI SHOW HERE. Earlier we presented panels from American Horor Story, The Walking Dead and Ari Lehman, the First Jason. Daniel Boyd presented a Horror Writing workshop, while a “Women In Horror” panel discussion stole the show. Professor Sinister’s Savage Sideshow has also been posted here. There were also three guys talking about science fiction toys. This year’s Toy Collector’s panel features Lee Harrah, Tim Arnott and your PopCulteer, Rudy Panucci, discussing the history of Science Fiction toys. Tim owns Third Floor Comics at the Nitro Antique Mall. Lee Harrah is a toy mercenary and MEGO expert. Your PopCulteer has been writing about toys for two decades now. Together, we manage to talk a lot. We cover the gamut from the 1930s to today, hitting all the high-points of science fiction toys along the way, from Flash Gordon to Star Trek, Planet of the Apes, Star Wars to Transformers and beyond. PopCult will present more video of ShockaCon 2015 all weekend long and into next week. You can see the Costume Parade HERE and Hurl Brickbats on the RFC MINI SHOW HERE. Earlier we presented panels from American Horor Story, The Walking Dead and Ari Lehman, the First Jason. Daniel Boyd presented a Horror Writing workshop, while a “Women In Horror” panel discussion stole the show. Professor Sinister’s Savage Sideshow has also been posted here. Professor Sinister brings his Savage Sideshow to ShockaCon 2015. 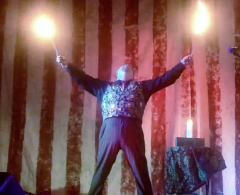 With help from some volunteers from the audience, the mysterious Professor displays feats of fire-eating, stage magic and a great escape. In his second year at ShockaCon, Professor Sinister left the crowd amazed and stunned by his daring acts of magical adventurism. PopCult will present more video of ShockaCon 2015 all weekend long and into next week. You can see the Costume Parade HERE and Hurl Brickbats on the RFC MINI SHOW HERE. Earlier we presented panels from American Horor Story, The Walking Dead and Ari Lehman, the First Jason. Daniel Boyd presented a Horror Writing workshop, while a “Women In Horror” panel discussion stole the show. Today’s art is a semi-abstract psychedelic exercise in color design, negative space, color composition and throwing everything at the wall to see what sticks. 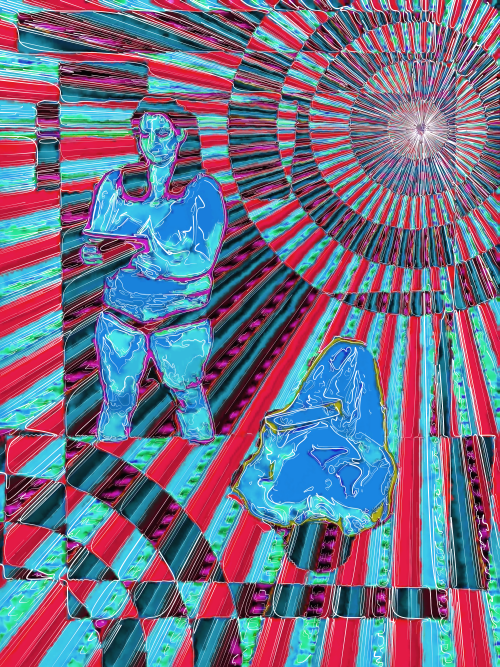 This is a digital painting, but if you squint hard enough you might find Pepper Fandango and Luna L’Enfant hiding in there amongst the dischord. Click to see it bigger. 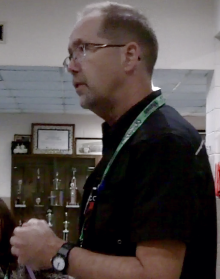 There will be no Radio Free Charleston or RFC MINI SHOW this week, as we are spending all of our time editing and posting video from ShockaCon 2015, which took place in Charleston September 18 – 20. Thus far we have brought you about four hours of panels, parades and performances. We will continue this until we have posted pretty much everything that we recorded. Check PopCult often over the next several days so you relive ShockaCon, if you were there, or see what you missed if you weren’t. 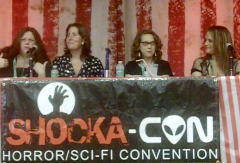 The “Women In Horror” panel from ShockaCon features Melanie Larch, Sheila Jordan, Tiffany Steele and Dakota Skye talking about the role women play in horror films, not just in front of the camera, but behind the scenes, writing, directing, and producing make-up, props, special effects, storyboards and more. In addition, the panel also discusses Women In Horror Month. Dakota Skye talks a little about her work with RAK Films. PopCult will present more video of ShockaCon 2015 all weekend long and into next week. You can see the Costume Parade HERE and Hurl Brickbats on the RFC MINI SHOW HERE. Earlier we presented panels from American Horor Story, The Walking Dead and Ari Lehman, the First Jason. Daniel Boyd presented a Horror Writing workshop. Award-winning film director, writer and Professor at West Virginia State University, Daniel Boyd, speaks about the basics of writing horror fiction. With the movie, “Chillers,” and the graphic novel series of the same name under his belt, Boyd shares his lifelong love of the horror genre and his four decades of experience writing horror. PopCult will present more video of ShockaCon 2015 all weekend long and into next week. You can see the Costume Parade HERE and Hurl Brickbats on the RFC MINI SHOW HERE. Earlier we presented panels from American Horor Story, The Walking Dead and Ari Lehman, the First Jason. 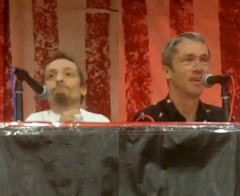 Drew Rin Varick and Mat Fraser both were cast members of American Horror Story: Freakshow and they appear at ShockaCon 2015 and take questions from the audience and moderator, Kennie Bass. The two discuss working with Ryan Murphy and developing a career while overcoming physical challenges. PopCult will present more video of ShockaCon 2015 all weekend long. You can see the Costume Parade HERE and Hurl Brickbats on the RFC MINI SHOW HERE. Earlier we presented panels from The Walking Dead and Ari Lehman, the First Jason. 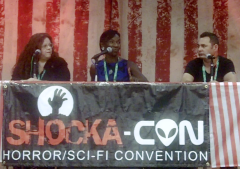 Jeryl Prescott and Adam Minarovhich, who both were cast members of the first season of The Walking Dead appear at ShockaCon 2015 and take questions from the audience and moderator, Melanie Larch. The two discuss their early exit from the show, what it was like working with the Walking Dead crew, and what they’ve done since. PopCult will present more video of ShockaCon 2015 all weekend long. You can see the Costume Parade HERE and Hurl Brickbats on the RFC MINI SHOW HERE.The Q&A with Ari Lehman is HERE.